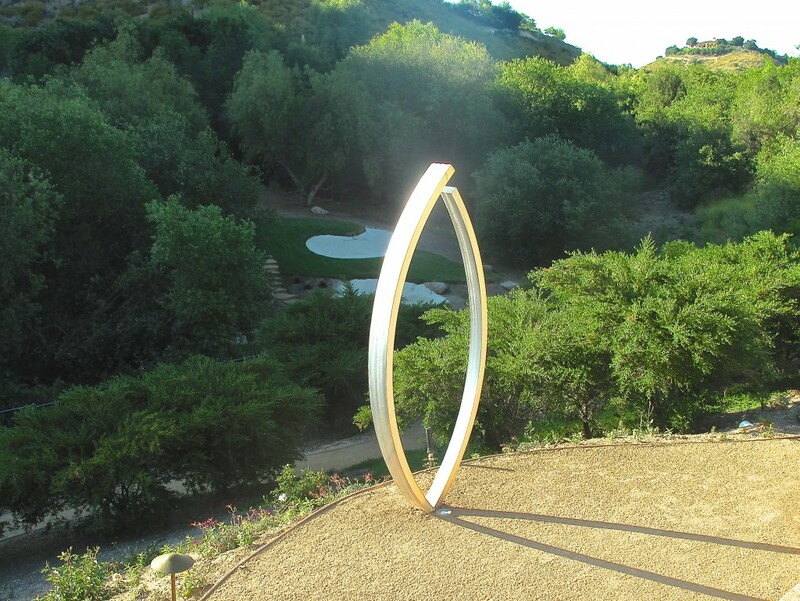 Outdoor sculpture adds dimension, visual interest, surprise, color and movement to both interior and exterior spaces. Ask any of our collectors if their outdoor environment was greatly altered by the presence of a sculpture and their answer would be a resounding YES. With so much at stake, deciding where to place art within a courtyard, garden, or expansive outdoor space should be thoughtful and precise, so that both the space and the art are tethered by a symbiotic connection. Over the years we’ve been fortunate enough to see our sculptures placed in some wonderful gardens. We’ve become experts at some key principles of choosing the best location or analyzing a site for integrating sculpture. The stainless steel sculpture Sisters provides a contrasting, geometric focal point in this clean, classic green garden. Gardens offer up different rewards. Some provide utility and sustenance through edibles and fruiting trees. Other gardens provide vitality and excitement through color and form. Many landscapes offer peacefulness and sanctuary through reflective surfaces and patterns. Some are left natural while others are highly planned and manicured. Determining what type of overall design and function your garden provides is the first step to deciding where a piece of landscape sculpture should go. Background should always be considered in placement, especially with a sculpture that has a “see through” quality like Sisters or Embrace. The height and stature of the outdoor sculpture should be in scale with the background to support an expansive view, and provide a place to rest the eye as a focal point. 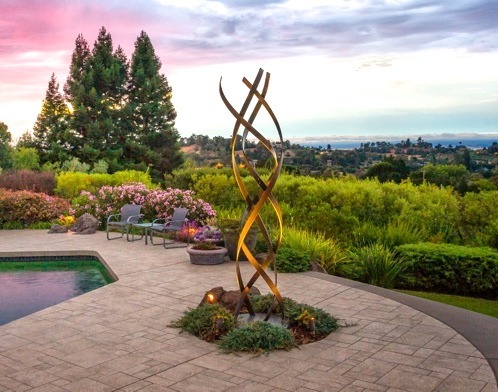 We often “scale up” the size of our sculpture for clients with a more expansive or spacious site like a 10 foot Kismet sculpture we created for a collector in the San Francisco Bay Area (above). But you don’t need a grand sweep of space to support a piece of art. As long as the piece is proportional to the space, it can complement the garden or courtyard. Using texture and color to support a piece’s placement is another way to determine a proper site. 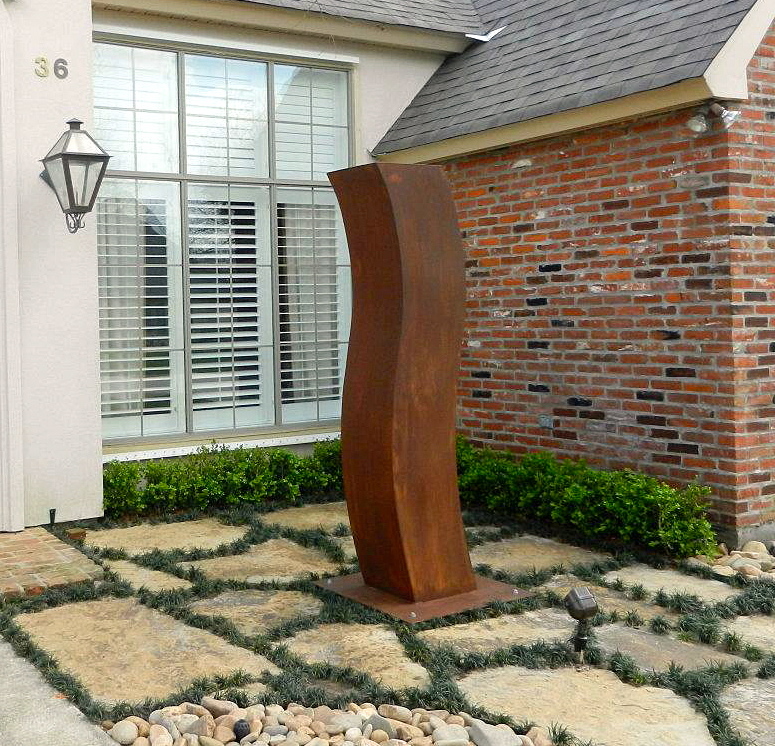 A Louisiana client installed a 7 ft. tall Curvas in their front courtyard (above). The weathered steel of the sculpture connects to the brick on the home and the curved of the pavers and stones lead the eye vertically from bottom to top. The jutting waves of the sculpture provide a sensual but stark contrast to the straight lines of the client’s traditional home. Every lead actor needs a good supporting cast. Similarly, a bold piece of landscape art needs the support of a well-grounded garden. Some pieces do well with a simple garden with subtle lines and minimal color. Other pieces work well in gardens with sculptural plantings and natural elements in harmony with the sculpture’s shape. We love how our Taffy sculpture is integrated as a focal point into this modern garden in Pacific Palisades, California (above). The rust-hued foliage of the plants are so interesting alongside the weathered steel sculpture. The billowy curves of the grasses mimic the curves of Taffy’s curled form, while other spiky grasses offer a wonderful contrast. 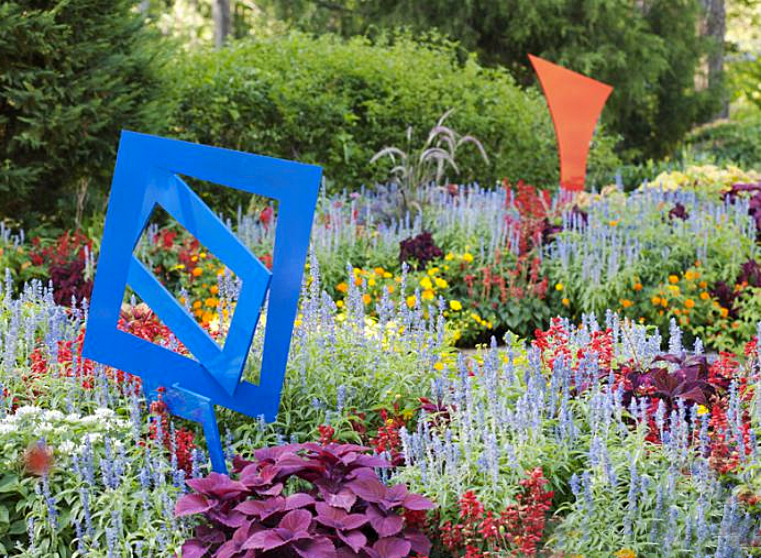 Saturated colors and bold shapes of our Closer and Leap sculptures are extremely impactful jutting out of the naturalized meadow plantings of this summer garden in Arkansas (above). Impact creates emotion. When you connect with a piece of art, it should stir something inside of you. It’s the reason you commissioned or purchased that piece and that feeling should emerge every time your eye glances at the sculpture. Everyone is drawn to different characteristics of art. Things like color, form, texture, and scale have the ability to elicit a response. 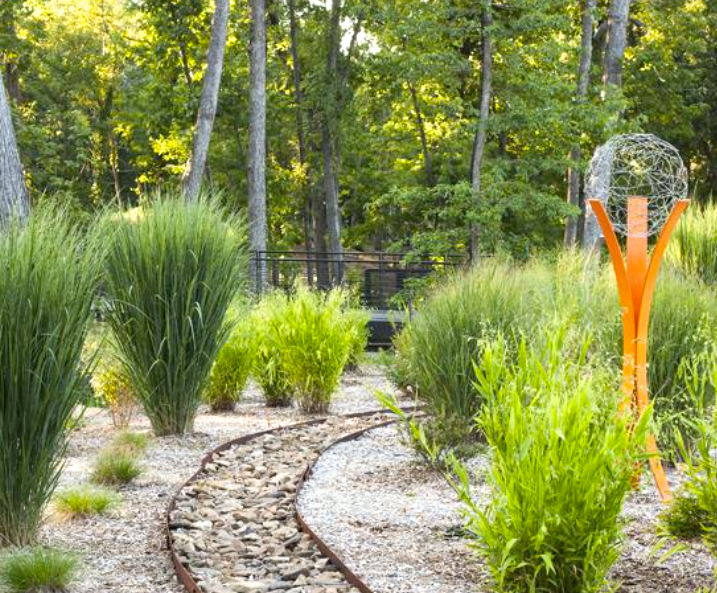 The key is to acknowledge that response by placing the sculpture in a landscape that will maximize the reaction. 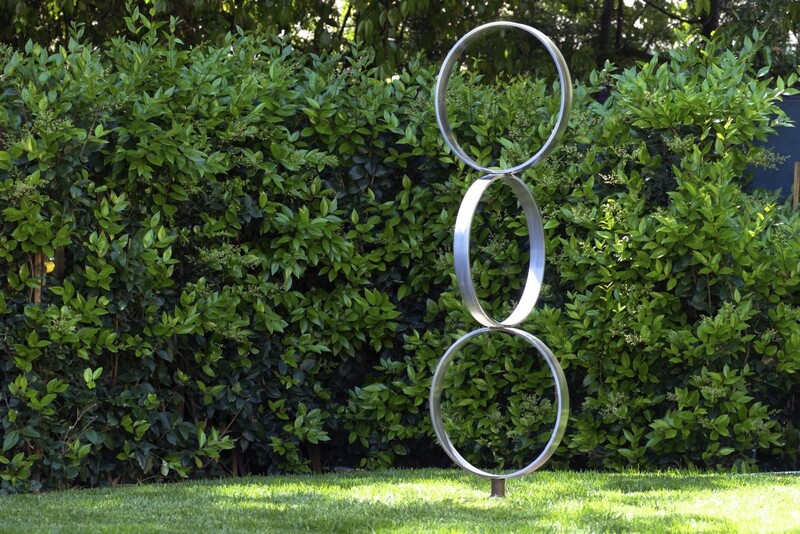 Create an element of surprise in the garden with the sculpture placement. Coming upon an interesting sculpture while walking on a meandering pathway is a magical and interesting way to integrate sculpture – and to further enjoy the wonders of the garden. It may take a few trials to determine the best spot for an emotional reaction to take place. Remember that sculpture can also be moved and experienced from places in the landscape during the years. When the spot is right, you will know it.